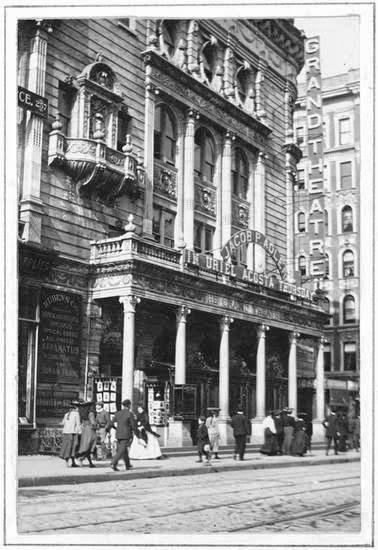 In 1903 architect Victor Hugo Koehler’s impressive Lyric Theater opened on 42nd Street. 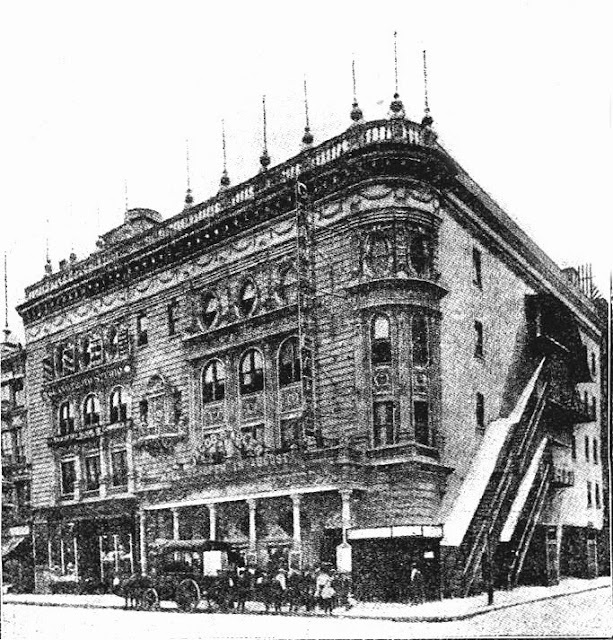 The Longacre Square area, which would be renamed Times Square the following year, was seeing an explosion in legitimate theater construction. But blocks to the south and less noticed, another theater designed by Koehler opened that same year. The Grand Street neighborhood was a mixed bag of stores and tenements; its population composed mainly of German Jews. The Grand Street Theatre was intended to offer this Lower East Side audience with Yiddish plays—a world apart from the fare produced in the Lyric. Architecturally the Grand Street Theatre shared much with is uptown counterpart. Working in brick, stone and terra cotta, Koehler embellished the façade with neo-classical motifs—pushing the elaborate ornamentation to the edge of taste without slipping over it. A classic balustrade along the roofline sprouted a crop of unusual spiky pinnacles. 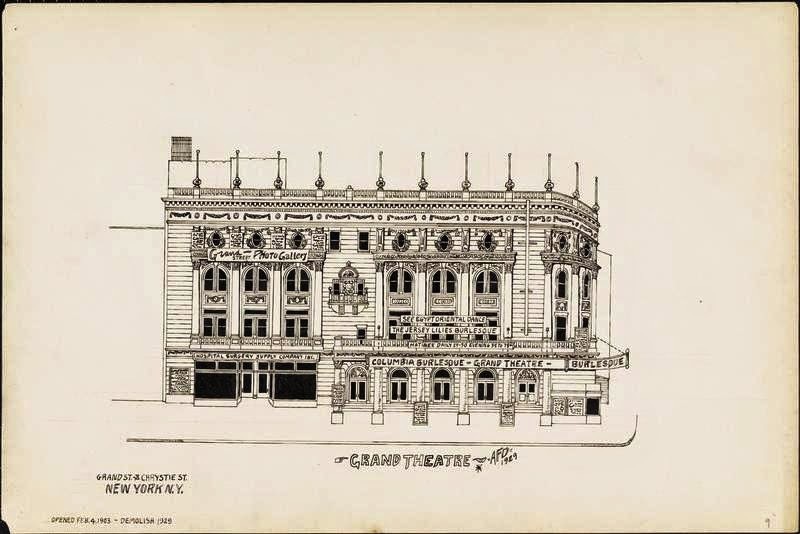 The theater sat on the site of the old Lord and Taylor store at the southeast corner of Grand and Chrystie Streets. The property had been purchased by Elias A. Cohen a few years earlier for $30,000, who resold it to developer Harry Fischel. Fischel’s completed dual-purpose structure would provide extra income with office space behind the theater portion. The theater—the first to be established solely for Yiddish drama in New York--opened on February 4, 1903. It was run by Russian actor Jacob Pavlovich Adler, who had attained stardom in Odessa and later in London. He was forced to leave Russian in 1883 when the Government prohibited Yiddish theater. A serious actor, Adler staged translations of classic and modern European plays. He recruited playwright Jacob Gordin who wrote works like Der Yiddisher King Lear (The Jewish King Lear) for Adler’s company. Two months after the theater opened, horror visited Adler’s homeland. On April 19, 1903 Russian mobs attacked the Jewish population of Kishinev. When the two-day pogrom finally ended, 47 were dead and 92 severely injured. More than 700 homes were destroyed and 600 stores plundered. 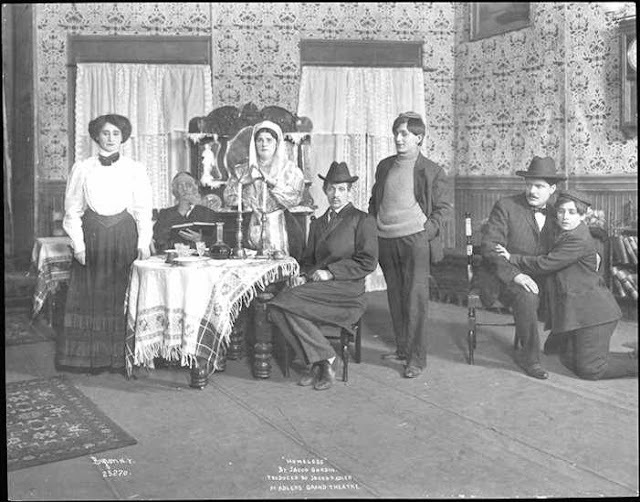 Another benefit performance of the play was staged on June 1. Among those making a statement by their presence were the powerful Episcopal Bishop of New York, Henry C. Potter; the Manhattan Borough President; and Supreme Court Justice Greenbaum. Also appearing in Broken Hearts would be Stella, the Adlers’ four-year old daughter. It would be her first appearance on the stage; the initial step in a vibrant dramatic and coaching career. In actuality, Adler was being controlled by the Yiddish actor’s union. The Sun called the union the “real octopus in the ghetto” that “rules the Yiddish stage.” The union’s power was such that when Jacob Adler wanted his non-union sister-in-law, Mrs. J. Louis, for a part in an upcoming play, the union nixed it. “He was anxious that Mrs. Louis should appear with his company, believing her to possess real talent. But she cannot appear even in Mr. Adler’s theatre,” said The Sun on April 10, 1904. Adler’s continued conflict with the United Hebrew Trades union came to a climax on September 6, 1906. The union had insisted that he fire a musician, who was a member of a different union, and replace him with one of their own. Adler refused. It resulted in the “actors, scene shifters, musicians, ushers, chorus singers and all” walking of the theater and shutting it down. The strike was settled, but the relationship between Adler and the union would continue to be contentious. 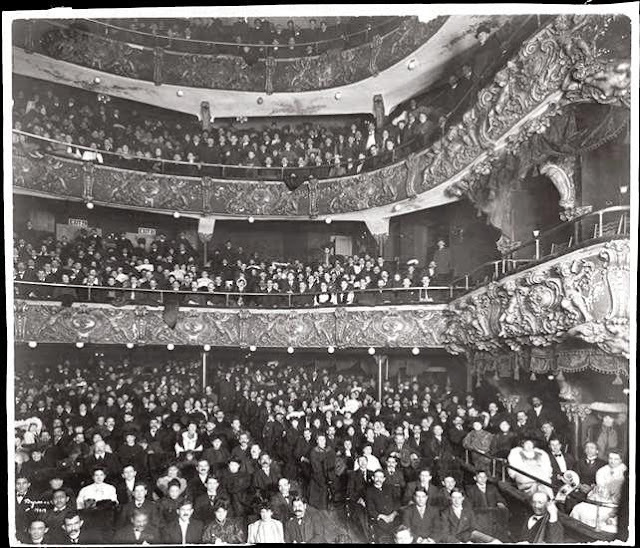 Patrons were blissfully unaware of the labor difficulties; and on October 13, 1907 three audience members were concerned only with what they felt was a tepid production. That night was the opening of God, Man and the Devil, called by the New-York Tribune “a thrilling drama.” The newspaper estimated the audience at about 2,000. Adler’s attorney, Abraham Levy, tried a novel defense. The Sun reported “Abe Levy tried to prove to the Magistrate that I was something in the way of a sacred concert, but was not successful.” The judge held the men at $500 bail. Adler leased the theater to the Bedford Theatrical Company. By 1913 Marcus Loew was screening motion pictures in the theater. As had been the case several years earlier, patrons heard “Fire!” instead. The 1,600 people in the theater rushed up the aisles and onto Grand Street. A passerby pulled the alarm box, and before long fire engines were clanging up the street. When calm was finally restored, “every one began to feel sheepish,” said The Times. “There was a gust of laughter and the tide turned. 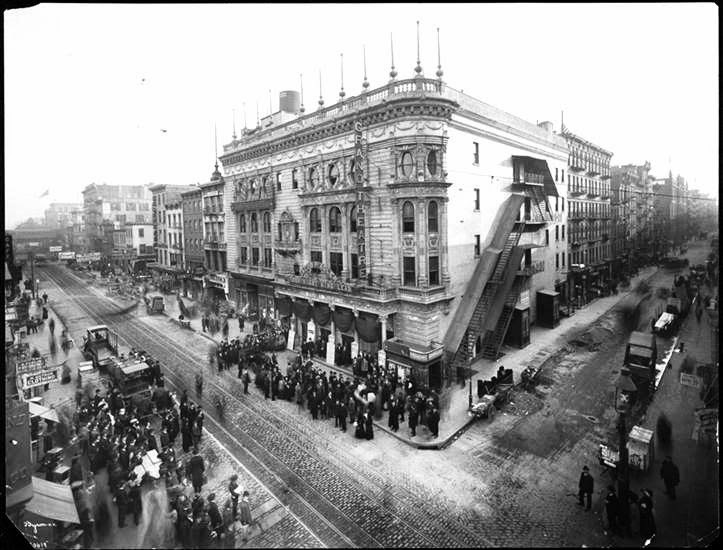 Every man, woman, and child started back to the auditorium.” Attendants could not check the tickets of the swarm and “they could not stop the rest of Grand Street that decided to enter the theatre at this moment.” Much of the Grand Street neighborhood was treated to a free movie that evening. 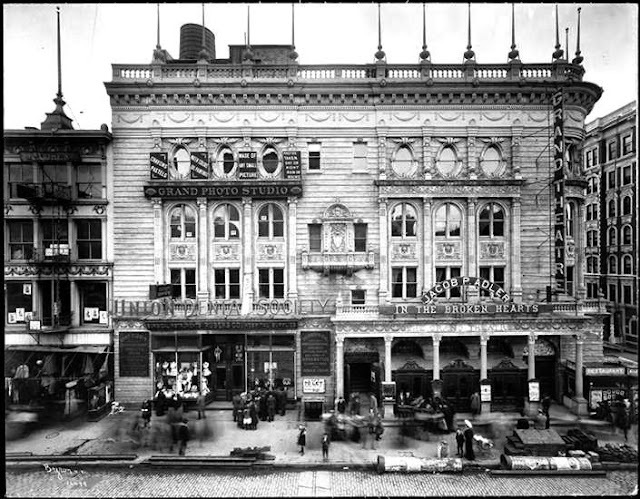 By 1926, the year that Jacob Adler died, vaudeville had joined motion pictures at the Grand Street Theatre. Vaudeville skits routinely pushed the limits of what 1920s officials deemed appropriate. On September 21 that year 21 women, three men and the manager, Nock Elliott, were arrested for “giving an indent performance, while the manager is charged with allowing it,” as reported in The Times. The Grand Street district continued to change and by 1930 was part of the growing Chinatown. On April 6 that year Grace Lynn, writing for The New York Times, reported on a Chinese production staged by the Wong Society. The Wong Society performance would be among the last in the Grand Street Theatre. In 1929 the City of New York had acquired all the property between Chrystie and Forsyth Streets. The plan was to widen both streets and to build low-cost housing. But instead, all the buildings in three-block section from East Houston Street to Canal Street were demolished before 1934—including the Grand Street Theatre in 1930—for the 7.8-acre Sara Delano Roosevelt Park. This was a great expansion of a favorite old subject, thank you. I was long aware of the Grand and Jacob P. Adler's legendary presence. This is discussed, fairly emotionally, in "The Golden Age of 2nd Avenue" - an overview of the Yiddish Theater. Adler apparently made it onto the Grand stage once more, not long before his death, where Yiddish Theater veterans and audience members with long memories wept at the sight of him. It was delightful to see an interior shot and to be taken back to a rather skittish time where Jews could get in trouble, in their own neighborhood, for staging a play on the more widely-observed "sabbath". 2nd Avenue, of course, really became Broadway as we have known it now for a good 90 years.